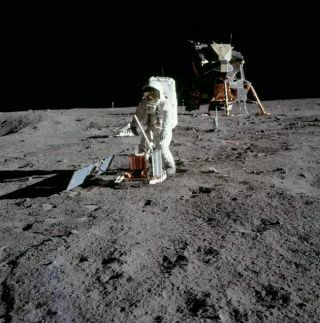 Buzz Aldrin deploys a seismometer in the Sea of Tranquility. Signals from seismic sensors left on the lunar surface by Apollo astronauts in the 1970s have revealed new insight into the moon's core, thanks to a fresh analysis using 21st century computing power. The new study provides the first confirmation of layering of the moon's core and suggests that the moon, like Earth, has a solid inner core surrounded by a molten outer core, researchers said. But the moon's interior also has another layer of partially melted material – a ring of magma – around its outer core, the study found. The findings come from data collected by four seismometers deployed on the moon by NASA astronauts between 1969 and 1972 during the space agency's six manned Apollo lunar landings. The seismometers kept working until 1977. "The data itself has been in continual use since the Apollo era," said the study's lead author Renee Weber of NASA’s Marshall Space Flight Center in Huntsville, Ala.
"The moon's deepest interior, especially whether or not it has a core, has been a blind spot for seismologists," explained Ed Garnero, a professor at the School of Earth and Space Exploration at Arizona State University, who also participated in the study. "The seismic data from the old Apollo missions were too noisy to image the moon with any confidence." Weber, Garnero and their colleagues took advantage of an innovative new technique — originally developed to analyze earthquake observations on Earth — to provide the first direct information about the moon's core. In addition to the lunar interior's layering, the study also suggests that the moon's iron-rich inner core contains less than 6 percent of light elements such as sulfur, researchers said. The new research is detailed in the Jan. 7 issue of the journal Science. At the heart of the new moon core study is NASA's Apollo Passive Seismic Experiment, which Apollo astronauts set up on the lunar surface during all six moon landings, beginning with the historic Apollo 11 flight in July 1969. Weber and her team did not use data from the Apollo 11 seismometer, but they did analyze the data from instruments deployed during the Apollo 12, 14, 15 and 16 flights. Another seismometer was also included in the final Apollo moon landing, Apollo 17, in 1972. Information from the seismometers was sent back to Earth for almost eight years, until they were switched off in September 1977. Moonquakes and meteoroid impacts accounted for the majority of the data, though NASA did intentionally crashed rocket stages of several Saturn V moon rockets and the lunar landers used in the Apollo missions to help calibrate the seismic network. Since then, scientists have worked to squeeze as much as possible about the moon's interior from the experiment, which is where Weber's team came in. Weber and her colleagues started by examining the existing catalogue of lunar seismic signals. Of these, more than 6,000 were deep moonquakes, occurring about 435 miles (700 kilometers) below the surface, the study found. These moonquakes originated from specific regions of the moon's interior, and each region produced repeatable seismic waveform signals, researchers said. Because of this, scientists were able to employ a seismic waveform stacking technique, which piles data from the same source on top of each other. The result was more than 100 stacks of individual deep moonquake clusters. On Earth, it is easier to see the different waveforms and seismic phases, but on the moon – which has a much more fractured surface from impacts – the seismic energy that reaches the surface is blurred and smeared. Scientists had to use computing techniques to "unblur" the signals, then arrange the stacks of data to provide a clear measurement of the moon's interior, researchers said. The density and size of the moon's core affects how long it would take for a moonquake to travel through it, Weber said. So the researchers could then predict when a hypothetical seismic wave would reach a certain point, which allowed them to compute the size and structure of the core with great precision. Over three decades have passed since the last seismograph, but the data they provided is still vital to lunar studies. Still, Weber expressed a hope for more data to work with. More seismic missions to the moon could provide scientists with the opportunity to further increase our knowledge of the lunar core, Weber said.